Study Focuses on Clothing Trends and Climate Impacts - Planet Aid, Inc.
“Apparel and footwear have a major impact on climate,” is the headline of a new global study about the fashion industry. Conducted by Quantis and the ClimateWorks Foundation, the new study, entitled Measuring Fashion, Insights from the Environmental Impact of the Global Apparel and Footwear Industries, examined a broad range of environmental impacts from clothing manufacture (from raw material extraction to spinning and dyeing), distribution, and disposal. Among Measuring Fashion’s more startling findings is that the apparel industry’s impact on climate change increased by 35 percent from 2005 to 2016. The industry currently accounts for an estimated 8 percent of the world’s greenhouse gas emissions. Even worse, unless the trends in the fashion industry are altered, climate change impacts from the industry are expected to double by 2030. 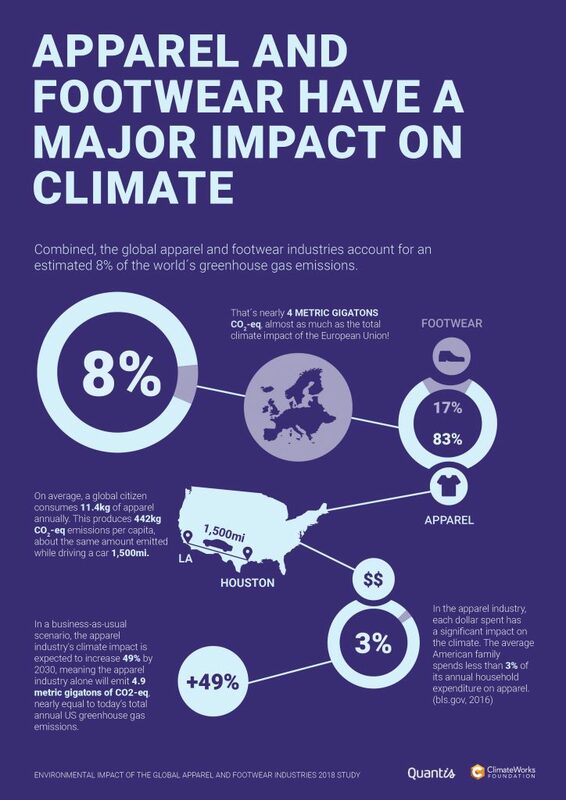 This means that in 12 years the apparel industry alone will emit 4.9 metric gigatons of CO2, which is nearly the current annual greenhouse gas emissions from all sources across the United States! One of the main drivers of this trend is ever-increasing levels of consumption, an outcome of the growth of fast fashion. On average each person on Earth consumes about 25 pounds of apparel annually, which results in approximately 975 pounds of C02, which is the equivalent of driving a car 1,500 miles. In comparison, consumption of apparel in the United States, where fast fashion habits are strong, is currently at 83 pounds per year. This level of consumption produces about 3,200 pounds of C02 per person per year. That’s equivalent to driving a car 4,800 miles. In addition to C02, the making of apparel has a large water demand and releases toxins into the environment, which affect ecosystems and human health. Most of the C02 impacts from apparel are in manufacturing, especially the dyeing and finishing processes and yarn preparation. These are very energy intensive and highly dependent on fossil fuel use, particularly hard coal and natural gas in places like China, India, and Bangladesh. Footwear just adds to the problem. The United States has the highest footwear consumption numbers, with approximately 7 pairs per capita. In comparison, European footwear consumption is at 2 pairs per capita, and in China, it’s slightly less than that figure. U.S. C02 per capita emissions related to footwear consumption is about 500 pounds per person per year (in China and Europe the figure is about 150 pounds per person per year). 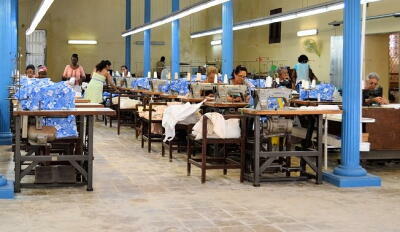 Measuring Fashion examined various scenarios for changing the destructive trend of the fashion industry. One of the key considerations is saving resources and trying new ways to get the most out each article of clothing. Improving clothing re-use was one option put forward, and the report goes so far as to suggest that clothing could be leased by users rather than owned, so as to extend its life. The report also indicates that the C02 impacts from the manufacturing process can be reduced by using more renewable sources of energy, such as solar. Measuring Fashion underscores that water impacts and toxicity pollution associated with manufacture can be reduced by relocating industries to places like the United States, which have strong water-pollution and toxicity-prevention systems in place. So what can you do today to help change the system? Consumption habits are key. Visit our blogs about Getting More Out of Your Wardrobe and Lessening the Harmful Effects of the Clothing Industry. And remember to always donate your unwanted clothing.